For wine-lovers, one of the great pleasures of a vacation in Tuscany is to take the opportunity to compare wines at an enoteca or a winery - wine tasting in Tuscany! One may simply be looking for a really appealing wine to take home or "educating the palate" by detecting and characterising the differences among wines from within the same wine appellation or by doing a "vertical tasting" of wines from the same vineyard but different years. Visit an Enoteca - this is the name for a location where a large range of wines is offered by the glass (or less) so that you can conveniently taste and compare different wines in a uniform environment. One of the most famous is in the Fortezza Medicea of Sienna. This is the Enoteca Italiana and it offers some 1600 different wines from all corners of Italy. A popular choice is to buy wine in groups of three glasses. These may be enjoyed outside under the pergolas in summer, and inside in small rooms in winter. Another, more technological, wine tasting establishment is Le Cantine in Greve in Chianti where you can buy a card of value suitable to the number or quality of the wines you wish to try. You introduce the card into the wine dispensers to fill your glass. Le Cantine specialises in Chianti wines, and usually there are around 140 available. If you don't use up all the credit on your card, the balance is refundable. These are just two well-known examples of dedicated wine tasting establishments. An advantage of the enoteca is that it will usually be in town, obviating the need to drive after "tasting" a quantity of wine. Visit a Tuscan vineyard - the roads of Chianti and other wine-producing parts of Tuscany are lined with "Degustazione" signs, meaning that wine tasting is offered. Most of these Tuscan wineries are quite small and there is always a chance that no one will be around to conduct the tasting, especially during busy times such as the annual grape harvest. However, the usual routine is that you will have the opportunity, free or for a small fee, to taste the wine produced on that property (only) - normally a couple of reds and a vin santo. The vineyard might have a wine sales point or you might do the tasting in the wine cellar, from bottles or from barriques. Very large properties have quite well-organised tours with programmed starting times, covering the vineyard, winemaking and cellars, as well as parts of the castle or villa as well. However, these very professional winery tours are much less common than in Napa Valley, for example. For the most part, you are dependent on luck - is the winery open, is the winemaker in a good humour and keen to explain his wines etc. Take a wine Tuscan tour - a number of individuals and small firms offer one day minibus tours that take you to between two and four wineries in a particular area of Tuscany, usually the Chianti Classico zone, Montalcino (Brunello di Montalcino), Montepulciano (Vino Nobile di Montepulciano) or Bolgheri and the Etruscan coast wine road, the location of the original "Super Tuscan" wine producers and still the home of several very famous wineries. 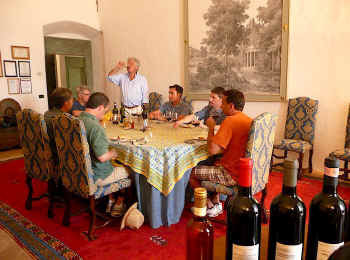 These wine tasting tours in Tuscany eliminate any problems associated with drinking wine and driving. The tour driver should also be an experienced guide, preferably with a sommelier certificate, so that you can expect an expert commentary and visits to atmospheric wineries that you might not find if you are exploring the area independently. A lunch in the wine zone is normally part of the tour, and a visit to one of the more picturesque villages in the area might also be included. These Tuscany wine tours can be private or shared. On private wine tours, you do not share your minibus with other participants and you have great flexibility in planning your tour with your guide. Shared tours cost less because you share your vehicle with other participants, usually not more than 8 in toto. The itinerary of a shared tour is usually quite fixed. • Full day private and shared wine tours from Florence and nearby to Chianti Classico castles, villages and wineries. Fixed prices offered. • Full day private and shared wine tours from Florence and nearby to Vino Nobile di Montepulciano and Brunello di Montalcino wineries. Fixed prices offered. • Full day sight-seeing tours from Florence and nearby to the Crete Senesi - Montalcino, Montepulciano, Pienza, Colle di Val d'Elsa, Abbey of Monte Oliveto Maggiore. Fixed prices offered. Tuscany Wine Tours Copyright © ammonet InfoTech 2008 - 2016. All rights reserved.